I am prone to hyperbole when it is warranted. Actually, my son proclaimed this the “best water bottle in the world” when he saw it and I thought that statement was quite funny. Following this post, I had the great pleasure of visiting Yuma, Arizona the home of Natural Delights Medjool Dates and they gave me this infuser water bottle since it was HOT (like sauna hot). They had packed it with orange and lemon slices and I refilled it many times throughout the day amazed at the way the flavor lasted (and made drinking water more enjoyable). I liked this water bottle so much that I moaned when it didn’t fit in my suitcase. Determined to find a way for it to fit, I stuffed my socks and underwear in it (then I had to scrub it when it made it home to Massachusetts). I took it to an author event in Springfield, MA and people asked me more questions about the bottle than my book (sad but true). You can put all sorts of good stuff in here apples, oranges, lemon, limes, frozen blueberries, strawberries, mangos – whatever you have on hand. I filled mine with watermelon and at the end of the day stored it in the refrigerator. It lasted 2 days before I refilled it with different watermelon. This will fit in your car’s cup holder (most likely) BUT it does leak if tipped over. 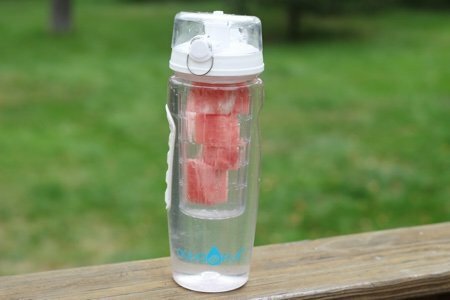 What do you think of this water bottle? 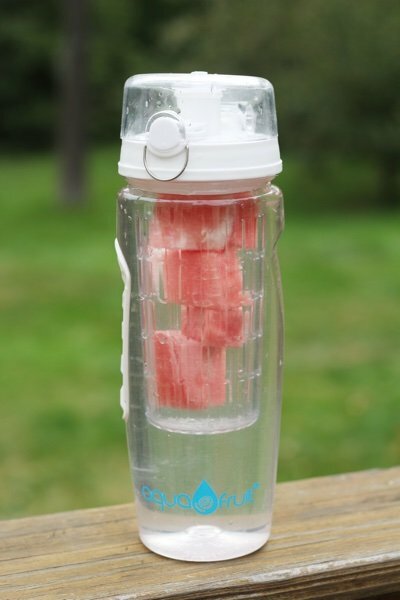 Do you think it would help you drink more water and less sugary drinks? Snack Girl went on a sponsored trip by Natural Delights Medjool Dates. This post is not sponsored. Lisa, I love that water bottle... I know it would help me drink more water except it is out of my budget so I guess I will just have to try to add slices of lemon or lime to my own water cup, you know the one with the straw in it but the straw has a little ring on the bottom so it won't fall out of your cup.. I got a similar bottle at TJMaxx for $5. I really like adding mint and lemon to mine, but cucumber is good too! @Annie - Debbie has a good suggestion to look for it in discount stores. It is an expensive water bottle. Christmas or birthday gift request? Thanks for your comment! Thanks Ladies, I never thought about a discount store...I'm on a quest now.. LOL..
Another option is to slice up fruit, cukes, etc. & put them in a large pitcher in your 'fridge, then fill a "regular" bottle from that. Or a glass when you're home. @Marla - that IS the one I have. I didn't look hard enough for it on Amazon. I have changed the link in the post to show the $10.99 one. Thank you so much! Great idea except for the leaking. Thanks for the other readers' ideas, too. I would be worried about using the same fruit for more than a day due to the possibility of it growing bacteria. Maybe someone with more knowledge about that would comment on if this should be a concern? concept and price are great BUT it looks like it doesn't hold that much water. I find it a bit gimmicky. Why do you need a special bottle to drink water with fruit in it? I have just added fruit to my regular water bottle before, shaken it up, and I'm good to go. I guess it keeps it from trying to escape or hitting you in the face when you are drinking, but it isn't really necessary. If you don't mind buying extra stuff, it looks nice, but I agree with the comments about it being a bit small, and just filling your bottle with a pitcher from the fridge. This is a great post. I have done this many times with my shaker bottle (for mixing protein powders, etc. With liquid) and it works great. I add ice to help "muddle" the fruit and get the flavors out. It makes me love the water and I refill it several times and still enjoy the flavors. Have used honeydew melon and frozen raspberries in addition to what others have said. The fruit is like an extra little treat whenever one falls into your mouth! They make all sorts of these! I've had a friend for a few years now who introduced me to these. They make them cheap, they make them expensive, and they are really not so hard to find out here in AZ. For those of you who mentioned feeling uncomfortable drinking out of plastic, you might have to spend a little more money, but you can find them in metal and glass. I put blueberries and lemon in my glass and use a straw and eat the berries once I finished drinking the water, so yummy! There are lots of these available on Amazon, I've got several at home for all family members. Can't recommend them highly enough, and there are a few made of glass for the person who was worried about plastic. They're just not that easy to throw into a bag, obviously, but still great. All the ones i have are completely leak-proof. It's nice to separate the fruit from the rest of the bottle as it doesn't all slide into your mouth when you drink! That's why there's a basket in the middle and it is really not more expensive considering. All my bottles are BPA free. Well, since everyone else loved this bottle-- it must be me! I ordered this and was excited when it came- I had some berries in the fridge I wanted to use with my water. But, once I filled it up, I cannot get any water to drink from it (although it does leak if I turn it upside down). Help?? Sandra, Just log into your Amazon account and find the link for your orders. Select the order for your water bottle and it will tell you how to return it. They never send invoices because they use this easier method for returns. Good luck! I loving all your posts (just joined a couple of days ago)! I really like this one about this water bottle. I may have to invest in this one. Thank you for your thoughtful and inspiring words to help us all make it through to greater and improved health.